It happened! The much-anticipated boxing match between Floyd Mayweather and Conor McGregor actually happened. And boy, did it give us a run for our money. A fight everybody wanted, but never thought would actually happen; A match believed to be the fight of the century; A fight that ended with a technical knockout by Mayweather in the tenth round. In what was much more compelling than critics predicted, the fight left us satisfied even after dropping a Benjamin to join in on the festivities. Were you not entertained?! Though accompanied by defeat, McGregor served a purpose. He demonstrated a lack of endurance which contributed to his demise in the fight. The same goes for starting a business as well as growing said business. Without endurance, your thriving business could burn out before the fifth round in a boxing match even begins. If we have learned anything from the Mayweather vs McGregor fight, it’s that short bouts of intensity won’t win you a fight based on longevity. Mayweather followed a strict plan of defense, holding back his attack until the perfect moment. McGregor, on the other hand, came in with guns blazing. With heavy breathing and fatigued movements, the Irishman’s defeat was inevitable and seen by all in the fourth round. The same principal of endurance applies to business: it’s not a sprint, but a marathon. Being a business owner takes a certain type of tenacity. Successful and growing businesses aren’t the result of a few quick business victories here and there. Instead, they are the result of resilient, concentrated efforts of strength and control – the type of endurance demonstrated by Floyd Mayweather. As a business owner, it’s imperative to think before you take action and to always avoid looking for quick fixes. Every decision you make in business should benefit your company’s long-term goals. After watching the Mayweather vs McGregor fight, it’s apparent we live in a competitive world. With so many talented individuals, it’s hard to compete against the best. This is where creativity and the ability to think on your feet matters most. Mayweather’s composed demeanor in the ring set him apart from his competitor. He studied McGregor’s movements, endured the hits, and was able to adjust his strategy and come out as victor. Successful business owners are not afraid to get hit in the face every once in a while for the greater good of their company. The way to victory is nothing short of competitive, and a business owner must think creatively to outsmart their opponent. To endure against the best, one should be ready to face any challenge no matter how big or small. The strength of business-minded individuals relies on never losing sight of long-term goals – no matter the cost. Mayweather agreed to fight McGregor after two years in retirement and with everything to lose. Not only was his reputation as a boxer at stake, but the integrity of the sport as a whole was on the line as well. Many times in business, we must take big risks to achieve an ever greater reward. We lose friends, family, sleep, and sanity, but we know the payoff will be worth it. Success comes at a cost. For Mayweather, he endured and didn’t back down, no matter how many times pressured otherwise. His risk paid off and he can now re-enter retirement with a 50-0 record. Businesses fail because they lack the endurance to keep pushing at the first sign of failure. From battling everyday difficulties like unforeseen expenses, hostile clients, and surviving in today’s changing business economy, it’s easy to give up. The point at which most would quit is what sets apart failed businesses from successful ones. Business is a constant battle of who can endure the most. 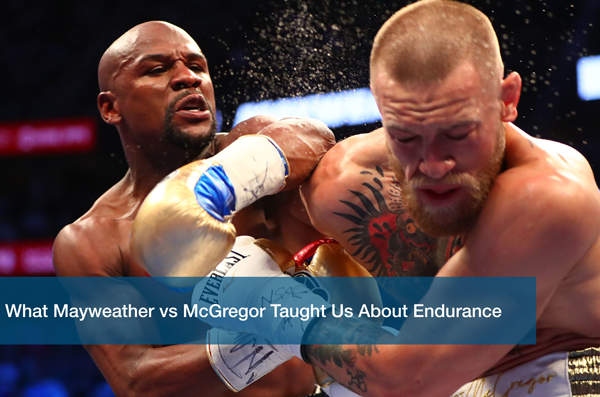 The Mayweather vs McGregor fight taught us the importance of endurance in business and how it can determine who ends up on top. Here at ITC, we offer a determined team of IT support to help you through your technological needs. Call us today to Schedule a Free IT Analysis so we can help your business reach new heights.